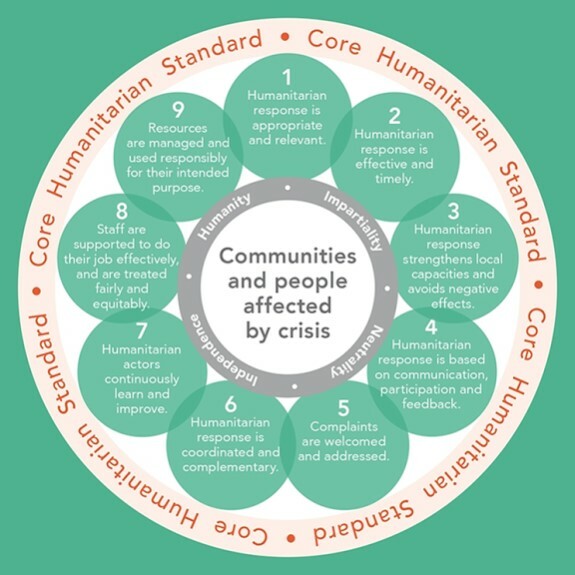 The Core Humanitarian Standard (CHS),launched in December 2014, is a set of nine Commitments to communities and people affected by crisis that encapsulate principled, accountable and good quality humanitarian action. While a voluntary code for humanitarian actors at present, the CHS aims to become a means of certification of agencies delivering humanitarian aid. CARE contributed to the development of the CHS and became a founding member of the CHS Alliance in June 2015. The CHS replaces the 2010 HAP Standards, People in Aid Code of Good Practice and (in 2017) Sphere Project core standards, but sits alongside the Sphere Project Technical Standards and Code of Conduct for the International Red Cross and Red Crescent Movement and NGOs in Disaster Relief as an inter-agency humanitarian standard. While the CHS is intended in part to consolidate the very many standards that have been produced to guide global humanitarian programming over recent decades, its raison d’être is to facilitate greater accountability to people affected by crisis because ‘knowing what humanitarian organisations have committed to will enable them to hold those organisations to account’. The CHS, in other words, places people affected by crisis at the centre of humanitarian action and promotes respect for their fundamental human rights. Each CHS Commitment includes its own set of Performance Indicators, Key Actions and Organisational Responsibilities against which CARE is able to test and demonstrate its compliance. As a founding member of the CHS Alliance CARE is also committed to contribute to the constant improvement of CHS verification tools and mechanisms. Therefore CARE might decide to adapt any of the CHS quality criteria and particularly the CHS indicators when we deem it appropriate in order to reflect CARE’s specific aspirations especially with regards to gender equality and women’s voice as well as on inclusive governance. In any case, CARE will consider and respect CHS indicators as the minimum standard. Refer to the generic CHS Guidance Note and Indicators and CHS self-assessment tool for further details and guidance relating to the monitoring of each Commitment. CARE is committed not only to upholding and promoting high standards of quality and accountability in its humanitarian programming, but also to demonstrating its own best practice. CARE is required to follow the four-stage CHS Verification Scheme, managed by the CHS Alliance – self-assessment, peer review, independent verification and certification – which allows it to measure and evidence its compliance with CHS Commitments at varied levels of rigour and objectivity. The CHS self-assessment tool guides organisations through the collection of evidence including structured feedback from staff, partners and people affected by crisism generated from the monitoring and evaluation of humanitarian actions as well as from the review of documented organisational policies and procedures. the tool includes a scorecard whereby top-line scores against each of the nine Commitments as well as scores for diversity and for every Performance Indicator, Key Action and Organisational Responsibility that fall under each Commitment are generated. CHS Key Actions: Routine monitoring and evaluation and particularly Rapid Accountability Reviews (RAR) which take place during each CARE emergency response and are centred around the nine CHS Commitments will generate the core of the required data and documentation. CHS Organisational Responsibilities: Lessons and recommendations from After Action Reviews and response evaluations will ensure that CHS verification processes are rooted in the real, current experience across emergencies and across the CARE confederation. For further details about the link between CARE’s accountability processes and CHS assessments refer to section 6 (HAF Accountability System). Under the leadership of the CARE Emergency Group (CEG), CARE will complete its first CHS self-assessment by June 2017 and will then set out a timeline and process for achieving full CHS certification.